Crush Their Butts | Indigenize! Following is one of my favorite poems. It was written by Gary Snyder at a Sierra Club wilderness conference in 1969, and depicts our favorite bear in jeans and ranger hat as the reincarnated Virocana Buddha. 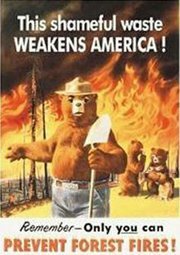 Despite the problematics of putting out forest fires that might actually be beneficial, Smokey remains a powerful character in the American imagination. The poem came to my mind this morning after listening to the news. Oy, do we need this bear and his vajra-shovel now. Once in the Jurassic about 150 million years ago, the Great Sun Buddha in this corner of the Infinite Void gave a Discourse to all the assembled elements and energies: to the standing beings, the walking beings, the flying beings, and the sitting beings — even grasses, to the number of thirteen billions, each one born from a seed, assembled there: a Discourse concerning Enlightenment on the planet Earth. Indicating the Task: his followers, becoming free of cars, houses, canned foods, universities, and shoes; master the Three Mysteries of their own Body, Speech, and Mind; and fearlessly chop down the rotten trees and prune out the sick limbs of this country America and then burn the leftover trash. And he will protect those who love woods and rivers, Gods and animals, hobos and madmen, prisoners and sick people, musicians, playful women, and hopeful children. Now those who recite this Sutra and then try to put it in practice willl accumulate merit as countless as the sands of Arizona and Nevada. Will always have ripe blackberries to eat and a sunny spot under a pine tree to sit at. AND IN THE END WILL WIN HIGHEST PERFECT ENLIGHTENMENT. I had forgotten this story–remember reading it decades ago when I first encountered Gary Snyder. Thank you for the reminder. Wow! This is awesome! So glad I checked out your blog, Tina. You have a real gift for it. I’ve gotten so much out of it already.